The recently formed group, Friends of the Waikanae Town Centre, says the results of a comprehensive survey the group has conducted confirms its belief that KCDC and NZTA have ignored the Waikanae community’s sentiment in the plans announced for the Main Road as part of the State Highway 1 revocation process. The survey, which started on 24 April and ran for 17 days, came about after the group noted a straw poll conducted on the Kapiti Coast Facebook page showed about 90% were opposed to the changes. 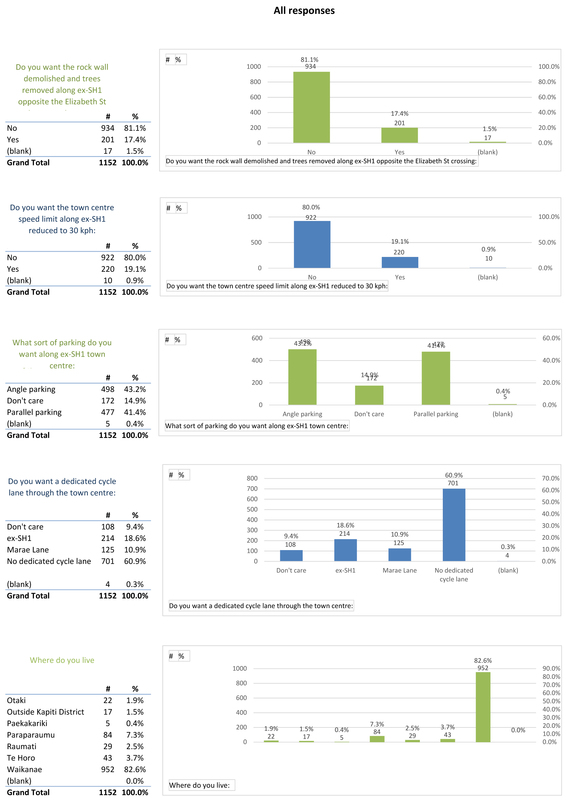 Friends of the Waikanae Town Centre decided that a more comprehensive survey was needed and with financial support from the Waikanae Community Board it was quickly up and running. The survey was conducted in both on-line form using Survey Monkey and in paper form with copies of the same questions distributed via local shops, supermarkets and other community venues. 1,152 people had their say with 785 responses from Survey Monkey and 367 paper responses. The group is confident that the results are reliable as Survey Monkey responses show only a very small number of multiple responses per IP address, and group members have scrutinised the written responses for any obvious duplication of handwriting styles; there were none. “The 1152 responses is a substantial number by national survey standards and the 952 from Waikanae residents is nearly 10% of the total population, says David Sherar, spokesman for the group. 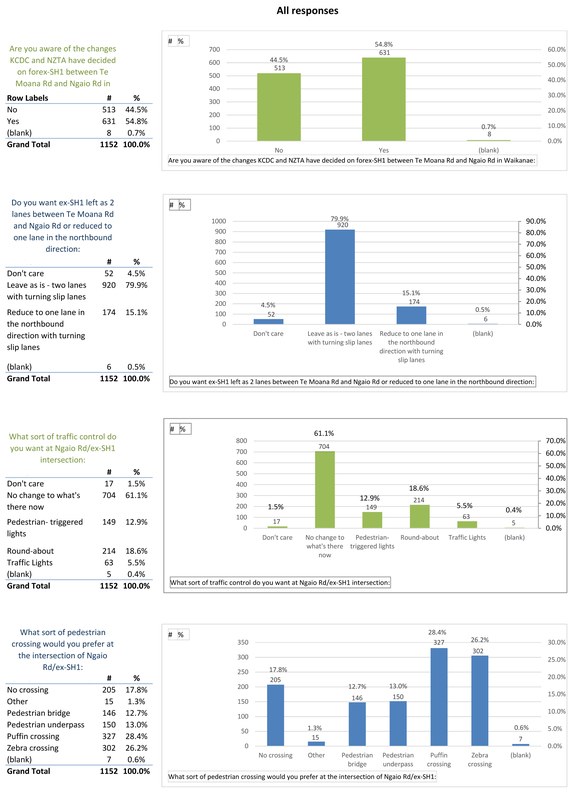  Over 46% of Waikanae residents didn’t know about the plans promoted by KCDC and NZTA, calling into question KCDC’s community engagement practices.  81% of Waikanae respondents do not see the need for any change to Waikanae Main Road as part of the revocation of SH1.  Waikanae residents see no need for additional traffic control at Ngaio Street, with 62.3% voting to leave the intersection as it is.  Asked about pedestrian crossing at Ngaio Street, the vote was split with Puffin Crossing and Zebra Crossing combined taking 55% of the vote.  An overwhelming 81% of people do not want to see the rock wall and trees demolished for the planned changes.  Over 80% of respondents do not want the speed limit reduced to 30kph through Waikanae town centre.  More than 63% of Waikanae residents see no need for a dedicated cycle lane through Waikanae town centre.  The only issue on which there is a close vote is parallel versus angle parking, which is a 50-50 split. Mahara Place businesses expressed their desire for angle parking and are supported by both the Waikanae Community Board and Waikanae Ward Councillor, Michael Scott. Their votes were not included in the Friends of Waikanae Town Centre survey but would have swayed the results towards angle parking, contrary to the Council vote on proposed parking. Friends of Waikanae Town Centre believes the 50% acceptance of parallel parking has come about because 80% of the community just wants the road left as it is. Friends of the Waikanae Town Centre thanks everyone who took part in the survey and the many local businesses who provided a place where members of the community could access it. The way the community has come together on this issue is testament to Waikanae residents’ strong interest in their town.